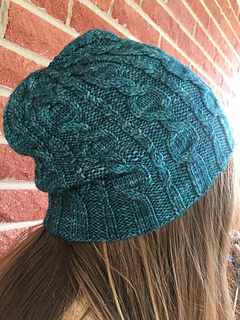 Hat for adult small (medium, large) – approximately 18 (20, 22)” head circumference at ribbing (unstretched), to fit roughly a 20 (22, 24)” head circumference. 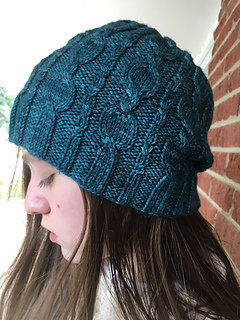 Sizes: Hat for adult small (medium, large) – approximately 18 (20, 22)” head circumference at ribbing (unstretched), to fit roughly a 20 (22, 24)” head circumference. 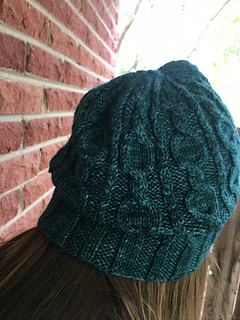 Sample hat shown in size medium. If you want a size in between, I recommend going down one needle size for a tighter gauge. For a slouchier fit, knit one size larger than normal. • 1 skein Knerd String Worsted (100% Merino; 218 yards, 100g) or similar worsted weight yarn. Sample shown in Rhymes with Seal. Gauge: 22 sts and 26 rows = 4” in stockinette stitch and 28 sts and 26 rows = 4” in Rings Around pattern.